A.J. 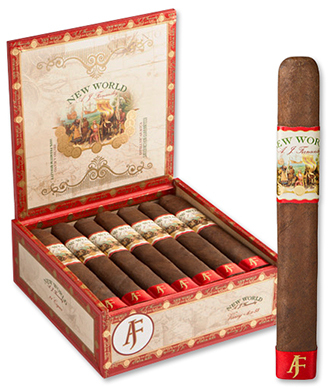 Fernandez and his father Ismael joined forces in 2014 to create the New World line of premium cigars. Hand-rolled in Esteli, Nicaragua, at Tabacalera Fernandez under A.J. 's watchful eye, this box-pressed Nicaraguan puro offers the finest hand-selected tobaccos found only in the four main tobacco regions of Nicaragua. The beautifully constructed, medium- to full-bodied New World Oscuro cigar is blended with long fillers from Esteli, Ometepe, and Condega, binder from Jalapa, and then showcased in a Dark Nicaragua wrapper. Notes of coffee, pepper, wood, and chocolate abound in this refined, balanced, and very enjoyable smoke.